Maria's second recording, For a Song, received a 2002 Juno Award Nomination in the Roots/Traditional Solo category. Produced by Shannon Johnson, For A Song features 11 of Maria’s original songs and one traditional Newfoundland song. Musical support was provided by an impressive cast: Canadian Celtic group The McDades, Shannon Johnson (violin), Craig Korth (banjo, guitar, dobro), and with guest appearances by bluegrass band Jerusalem Ridge, Con O’Brien from the Irish Descendants (backing vocals), and Lester Quitzau (dobro). The songs range from The Lingan Strike, a rousing tale from Cape Breton’s labour history, to Take it Easy on Me, a gentle anthem for contemporary society. 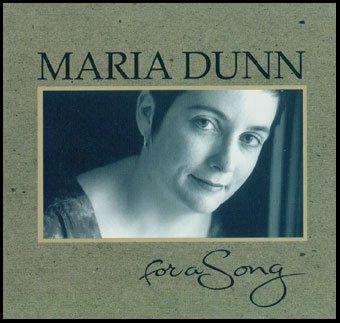 Maria Dunn scores twice in a row with this second CD, a noble feat for a newcomer. Her songs explore people and places in illuminating and highly poetic detail, sung with conviction. This CD staked it's claim our CD player for an extended time, and was thoroughly enjoyed by all. The CD captures Maria at her best, the songwriting is superb and the performance immediate and strong. Its an excellent body of work, and a pleasure to listen too. ...A finely crafted work that shows Dunn off as an artist who knows her strengths and is comfortable with both her material and a strong supporting cast. The timeless quality of music like Dunn's forever has a place in people's hearts.